In England, earthwork castles (both motte and bailey and ringworks) were constructed mostly in the hundred years after the Norman invasion. After this, most were gradually phased out, as they were replaced with stonework and as more time could be spent over a castle's construction (the natives being more friendly by this point). In Wales, earthwork castles often remained in use for far longer; the speed of construction was much shorter than that for a stone castle (Caernarvon taking around 50 years to complete), which was a vital consideration when bearing in mind the possible hostility of the local Welsh populace. Also, earthwork castles were erected at strategic points during the early Anglo-Norman colonisation, and to replace these early castles with the latest standards would mean either knocking down the old site to build on (leaving it vulnerable in the mean time), or relocating the castle's siting (as at Rhuddlan and Criccieth, for example) - possibly to a strategically or tactically weaker point. Another reason for replacing earthwork castles in England was the sway from use primarily as a military site into one of lordship and grandeur - earthwork castles usually had too limited space for this. Later castles still retained a military value, of course, but it is important to realise that castles in "safe" lordships (mostly away from coasts or borders) were less likely to be attacked, and could therefore concentrate on ostentatious display. This was not the case at most sites in Wales, however, where the local population's attitude to English rule could vary and change greatly. Therefore, earthwork castles generally continued in use over a longer period in Wales than in England - English earthworks are often seen incorporated into later castles (ie Helmsley, Pickering, Carisbrooke), more so than in Wales, where they continue to stand alone, unchanged by later developments. Montgomeryshire now forms part of Powys, and as a border area, it contains the remains of many earthwork sites. Almost all remain unexcavated, and most have scant documentary evidence; I list below a number of the better preserved ones, although others can be found across the area. Stands at a height of 340m overlooking the Powys/Shropshire border. Bishop's Moat is a 6m high motte, 13m across it's top; the motte stands on the west side of a 100x65m bailey. The site was founded by the Bishop of Hereford around 1120, and may have been captured by Llywelyn ab Iorwerth in 1233 (the referred to site being named Castell Hitheot). The earthworks now stand in the border town of Bishop's Castle - famous amongst the Dolforwyn excavation team as the home of the Chip Shop (serving Pineapple Fritters - if you don't know, don't ask! ), and The Three Tuns pub. A 4m motte (summit spanning 10m), with a triangular bailey 27mx48m long, with a steep slope on the NW edge. Presumed to be an outlying garrison from Rhos Ddiarbed (1km to the SW). The earthworks (27mx13m) are now triangular, but were probably originally rectangular and at least three times as large. Built in 1101 by Robert de Bellesme, and captured by Henry I's army in 1102. Repaired and garrisoned by Henry II in 1159-62, but wrested from English control in 1163 when captured by Owain Cyfeiliog and Owain Fychan. Henry retook it in 1165, but by 1187, Owain Fychan had retaken it. Typical of petty rivalries between Welsh nobles, Owain was slain in a night attack on the castle by his cousins Gwenwynwyn and Cadwallon. 1194 saw the English retake the castle, at which point it was refortified with a stone curtain wall (apparently to guard a nearby silver mine). In 1197, the castle was again handed back to the welsh, Gwenwynwyn being the recipient - in order to secure the release of a hostage (Gryffydd ap Rhys). 1212-13 saw Robert de Vipont's rebuilding of the site, and it is assumed to have been destroyed by Llywelyn ab Iorwerth in the 1230s, ending it's use. An alternative location for the stone castle is at Carreghofa Hall, where excavations in the 1870s revealed a square room with plastered walls of an unknown date. An impressive motte laying to the east of Newtown (possibly now in the golf course?). The inner bailey is 18mx38m, and has strong defences in the form of the River Severn to the east and north. The motte reaches a height of 9m, with a summit of 11m across. Other defences included a ditch. The outer bailey was 30m x 45m, with a 2m rampart protecting the outside flank of the motte. Probably built by Roger de Montgomery in the 1080s, to protect the important route alongside the Severn (other castles including Hen Domen, Montgomery, and Dolforwyn, in addition to Roman forts at Caersws and Forden Gaer). Excavated as part of the Five Castles Project to commemorate the 900th anniversary of the Norman Invasion. Hen Domen was the predecessor to Montgomery castle, and is dealt with on it's own page. Hen Domen is an important site, as it is one of the most comprehensively excavated castles in Great Britain. Some details may have been interpreted wrongly - the large number of buildings in the bailey at any one time may have been overestimated (see reconstruction drawings), due to the difficulty of interpreting short length occupations through material evidence. Now remains as a triangular bailey 70mx45m. The base of a tower is apparently buried (9m square?) in the low mound of the bailey's northern corner. Traces of a hall remain in the east corner. The site was still visible in 1811, but all above ground remains have now disappeared. This site may in fact be the castle of Snead occupied by Simon de Parcio in 1231, and given by Henry III to William de Bowles in 1233. An alternative site for this is Symon's Castle. Built by Madog ap Idnerth around 1135, to command the important ancient track along the Ceri Ridge - countering the power of the Mortimers in Montgomeryshire. It rises 7m above a ditch (spanning 10m at the summit), with a kidney shaped bailey 38mx24m below. The Ceri Ridge was an important track, following parallel to the Severn in mid Wales. Other castles overlook and guard the site - such as Symon's Castle (see below); and other earthworks can be found (for example, a motte lies behind the Blue Bell Inn between Bacheldre and Churchstoke - another favourite spot of the Dolforwyn excavation team!). The motte stands 6m high above a ditch, spanning 12m at it's summit. The 45mx35m bailey lies to the NE with a natural slope, ditch and rampart. Another Welsh motte, probably built by Owain Fychan ap Madog in 1166. The motte dates from 1280, when Owain de la Pole was granted a charter for a market at Llanidloes. The town was laid out with a rectilinear plan, alongside the Severn. 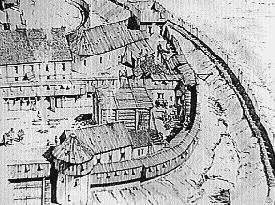 The palisade walls were completed with a motte forming the south side (town walls could often be defended by a strong fortification - ie Caernarvon). The motte is 30m across and 3m high, with an oval bailey 60mx50m, now obscured underneath a health centre. Nearby streams indicate that the town ditch may have been waterfilled. A royal seat - the original capital of the Princes of Powys. The site may have shifted from an earlier one on a hill top 1km away; the motte was probably built either by Owain Cyfeiliog (c1170) or by Robert de Vieuxpoint (c1210). The seat of Powys was transferred to Welshpool in the early c13th, and Llywelyn ab Iorwerth destroyed Mathrafal in 1212. Traces of wall still remain. This site has changed due to modern quarrying. It stands beside Offa's Dyke, and a ditch on the hill side may show some continuity between a Dark Ages site and a medieval site (not too uncommon). The final traces of a stone wall remain on the hill top, and probably enclosed an area of around 40mx35m. Round towers may have stood at the south and west corners. The site was probably the castle of Gwyddgrwg begun around 1260 by the owner of Caus Castle (Thomas Corbet), and destroyed in 1263 by Gryffydd ap Gwenwynwyn. After the fall of Dolforwyn, the local market was shifted from that site, down to the valley, where Roger Mortimer created Newtown in 1280. This would probably have been ramparted, and a mound rising to 5m with a 39m summit was built on the south side of the town. Foundations of a stone building were found by excavation in 1910, but this may have dated from 1641, when Sir John Price refortified the site during the English Civil War. Another earthwork built by Roger de Montgomery in the 1080s. This site has the layout generally conjured up by the description "motte and bailey": an oval outer bailey with a motte (9m high) closing one end. The summit of the motte is 15m across, and the bailey extends to 55m. The ramparts still stand 4m high , and the ditches were probably water filled from the surrounding marshland. Excavated. The 4m high motte has been increased in appearance by modern quarrying, but the siting of the motte explains it's use - it overlooks and completely controls the road (leading onto the Ceri Ridgeway). The castle would have been an ideal garrison point for controlling passage into and out of the local area. A stone curtain wall was added to the earlier motte (1.8m thick), and enclosed a court 21m across. Probably the seat of Powys before Powis Castle was built. Domen Castell stands near to the railway station, and may be the site built in 1111 by Cadwgan ap Bleddyn, ruler of Powys. If so, this is probably the castle captured by the Anglo-Normans in c1190, and recaptured shortly afterwards by Gwenwynwyn. When Gryffydd ap Gwenwynwyn plotted against Llywelyn ap Gryffydd from Welshpool in 1274, the site was still a wooden structure; it was destroyed when Llywelyn removed him. The ramparts have been changed greatly, but was probably 60mx46m, and the south side still houses a 5m motte (9m across at the summit). Map references and survey details are taken from: Salter, M 1991 THE CASTLES OF MID WALES Mike Salter has carried out a fair amount of survey work at sites across Wales, and his booklets are a useful source for less well known sites. A final word of caution should be extended if you use Ordinance Survey maps to locate earthwork castles: it is not unusual for mottes to be classified as burial chambers (and vice versa), and for earthworks of various periods to be classified wrongly. This is not surprising, really, bearing in mind the great amount of data the OS maps deal with, and in no way is this comment intended as a criticism to these useful maps - it is just a warning!